Ludwig Reisinger (b. July 15, 1863): guitar from the latter quarter of the 19th-Century (no date), bought from a private collection in Vienna. Reisinger was a student of Ignaz Johann Bucher. Bucher was a student of Johann Georg Staufer who also taught C.F. Martin before Martin moved to the US, which makes this instrument an exceptional find. This instrument appears to have been put in a crate shortly after it was made and presumably has never been played. It was stored by the collector and handed down from generation to generation in this 4th generation family of instrument collectors in Vienna. The crate was tight enough that so little air entered the crate that the wood\finish has only barely discolored. Reisinger was one of the most celebrated Viennese builders of the late 19th-Century. Documentation on this builder is below. This instrument is a priceless find for a guitarist performing 19th-Century music or an investor/collector of rare instruments. The tone is typically sharp and brilliant. The volume, even considering the size of the body, is loud and the playability is very easy. from Josef Zuth, Handbuch der Laute und Gitarre [Handbook for the Lute and Guitar ] "Reisinger, Ludwig. Celebrated zither and guitar maker. Studied with Joh. Bucher between 1877-81 Worked with Bucher as a helper until he became independent in 1887 in Vienna. 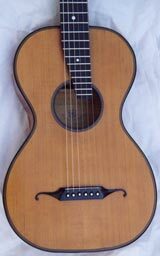 Reisinger had a particularly good reputation as a guitar maker." from Die Geigen und Lautenmacher [The Violin and Lute Makers] by Willibald LŸtgendorff]. " Reisinger, Ludwig. Student of Ig[natz] Bucher who worked with him from 1877 to 1887. In that last year, he founded his own shop and soon developed a good reputation. He also made good zithers and guitars." from Deutsche und …sterreichische Geigenbauer [German and Austrian Violin Makers]. "Reisinger, Ludwig. Student of Ignaz Johann Bucher, Senior, who worked in that workshop from 1877-1887. In 1887 founded his own workshop. Built very good zithers and guitars." 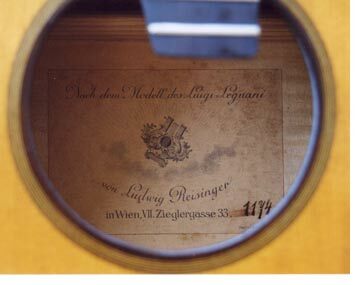 The label reads: "After the Luigini Legnani Model; (next line, etching of lyre); by Ludwig Reisinger; in Wien [Vienna] Zieglergasse 33. [address]; 1174 [handwritten instrument number]. frets: Note: this instrument, as with most designed after Legnani, goes up to the note d, rather than the traditional lower b of modern instruments. Essential for playing much of the music of the mid to late 19th Century. neck/fingerboard: The neck/fingerboard (as designed by Legnani and originally constructed by Staufer) is "free floating," i.e. it is raised above the soundboard to allow totally free vibration of the soundboard, for better playability and to allow for adjustment of the neck. 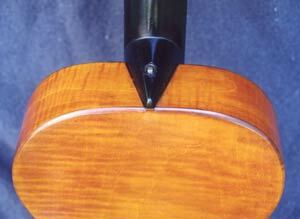 The neck is in perfect condition (as it presumably has never had strings). There is no warpage and no twisting of the neck.